Tuskegee University produces more research per capita than any other historically black college, and one reason is Shaik Jeelani. Tuskegee made a place for him 45 years ago and he was never persuaded to leave. As a smart child growing up in India, Shaik Jeelani really had no control over what he might do with his life. And that was just fine with Jeelani, who became the first person in his family to go to college. 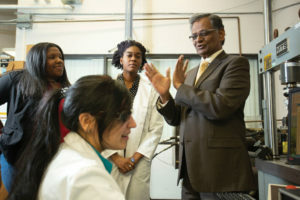 It was after college that his life diverted from the script, eventually leading to Tuskegee University, where Jeelani, now as vice president for research and dean of the graduate school, has forged a dual career as one of the country’s foremost researchers in advanced materials and as a mentor to hundreds of students. But if the original plan had worked itself out, he’d still be in India. That job was at Tuskegee, where Jeelani has raised a family and made a name for himself in engineering research. “It was the first place I had a job, and it’s hopefully my last,” he says with a laugh. While a number of Jeelani’s grants have been with the Department of Defense — he’s worked on materials for tanks, submarines and soldiers’ flak jackets — he’s also conducted or overseen a great deal of research applicable to Alabama’s emerging industries. As his job at Tuskegee has changed, Jeelani has spent more and more time out of the lab and more involved in landing research contracts for the university. 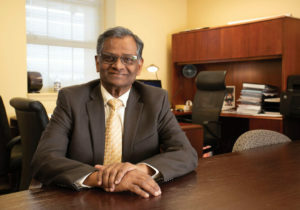 As noted as he is for his research, Jeelani says his first love has always been mentoring students, dating back to his high school and undergraduate days in India. That mentoring success continued throughout his time at NCSU and, now, at Tuskegee. Jeelani’s work has brought kudos from near and far, including the Presidential Award for Mentoring from President Barack Obama. His work has not gone unnoticed by his peers and others at Tuskegee. “During Dr. Jeelani’s three-plus decades of service to Tuskegee University, he has mentored students and colleagues alike,” says Roberta Troy, Tuskegee’s interim provost. Jeelani, who lives in Auburn, has three grown children. His two sons are both engineers, and his daughter is a physician, though she earned an microbiology degree at Auburn. Over the years, Jeelani has had chances to leave Tuskegee, but he’s stayed put at the place where he felt so welcomed in 1974. Alec Harvey and Robert Fouts are freelance contributors to Business Alabama. Harvey is based in Auburn and Fouts in Montgomery.